Despite walls of concrete, the natural habitat persists in soft bottomed portions of the LA River. Efforts to restore the LA River began in the 1980’s with activists and environmentalists. The movement slowly grew to include nonprofit organizations and city governments. The Urban Waters Federal Partnership, started in 2011, has provided a formal, coordinated effort to restore the river. Cities along the entire length of the river have seen the benefits of partnership projects with improved green space and water quality. Restoring the LA River to its natural state and promoting recreational activities. Attracting students and youth to the river. Working on clean-up efforts upstream to downstream. Coordinating on-the-ground efforts at all levels: from local, to state and federal government. Developing goals for the continued restoration of the LA River. The Urban Waters Federal Partnership includes eight federal agencies, state and county agencies, four cities within the watershed, and more than 15 non-profit and non-governmental organizations. Partners meet bi-monthly and vote on selected projects to include in the LA Watershed Work Plan, the program’s guiding document. Stakeholders of the Urban Waters Federal Partnership are now able to communicate more effectively, share ideas, and collaborate on projects, many of which cross multiple city boundaries. As projects continue to grow, partners have emphasized the importance of focusing on the watershed as a whole. Housing, pollution, and transportation also have impacts on the LA River so future programs focus beyond the banks of the river to help expand access and control pollution before it reaches the river. Formerly a maintenance yard, the nature trail winds into an infiltration area. river as a ‘destination’, but view it negatively due to its lack of natural features, including a channel of concrete in the river from previous flood control efforts. Efforts to re-open stretches of the river to kayaking and canoeing aim to reconnect residents with the river. A recent joint initiative funded through a grant from the U.S. Department of Housing and Urban Development (HUD) is creating a ‘waterfront’ district in Northeast LA to make the LA River a destination location. Efforts to restore the natural state of the river will not only help improve water quality, but will also help to create a positive image of the river and generate recreation and economic opportunities. Many LA youth lack access to the river. Efforts to improve access have included youth outdoor activities and education on the natural environment. Through the LA Conservation Corps, youth participate in the ‘River Corps’ and engage in river clean-ups, planting of native plants, and environmental education. River Corps youth educate community members who kayak and canoe on the river as part of their popular Paddle Project. The University of California, Los Angeles (UCLA) Luskin School of Public Affairs helps encourage interaction with the LA River project through the Rosenfield Public Affairs Fellowship Program. Through the program, a graduate student works with the Council for Watershed Health and the Urban Waters Program on a variety of projects, including analyzing the economic benefits of river restoration. The LA River Ecosystem Restoration Feasibility Study (the ARBOR study) is an important project in progress. The Urban Waters Federal Partnership actively sought funds to allow the ARBOR study to proceed, despite financial challenges in its early stages. Led by the U.S. Army Corps of Engineers, the study will examine a 10-mile stretch of the river to determine the options for restoring the river to a natural state while ensuring that flood control is maintained. The completion of the study will result in a coordinated plan for the river’s restoration and will serve to connect many of the partners’ individual projects into a coordinated network. A future focus for the partnership involves open dialogue with community members and stakeholders regarding a proposed high-speed rail system that will bypass the LA River. Meetings are being held to find an economically and environmentally friendly plan to minimize the impact on the river. 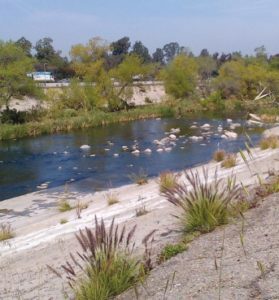 The Urban Waters Federal Partnership has developed a plan with multiple federal, state, and local partners to restore and revitalize the Los Angeles (LA) River watershed. Eight federal agencies, four cities, LA County, and the State of California government work in conjunction with local organizations to bring together unique views and conduct projects in the watershed. The LA River begins in the Santa Monica Mountains of Southern California and runs into the Pacific Ocean, covering 834 square miles of watershed. The river winds through 14 cities and varies from a concrete runoff ditch for flood control to a natural river for recreation. The Urban Waters Federal Partnership in the LA River watershed is improving the river for the more than 4.4 million people who live in the watershed surrounding area.